Last week Ryan and I were on a business trip. (more about that later) Since I had started working out, I decided I better continue with it or I would not be happy with myself. Fortunately for me I had two weeks of working out under my belt and was in a nice groove, was now able to walk after being so sore from working muscles I never knew I had, and our hotel had a fitness studio which offered actual classes! 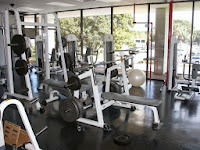 The first day Ryan and I went to the fitness room that had all of the machines and weights. I busied myself on the treadmill and then the elliptical and later with weights. There were maybe two other people in the room. I don't know much about workout etiquette, but I do know that I felt odd when a guy came and went on the elliptical right next to me when there was an entire wall of available machines! 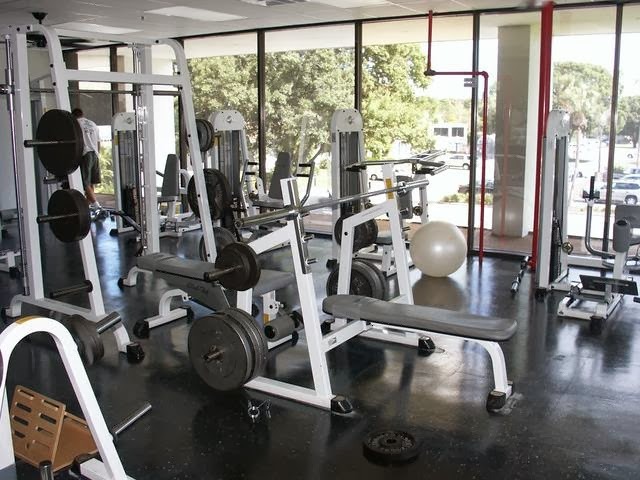 (Ry said that workout etiquette says you leave a machine between you.) Anyways, we left feeling pretty accomplished. The second day I joined a Zumba class. I was pretty excited because I knew it would be more interesting then the day before doing a bunch of things on my own. I tried to talk Ry into doing it with me, but nothing I said would convince him to give it a try! I ended up being the only one in the class. My instructor was from Puerto Rico and had moves like Jagger. I do not have moves anything close to that and let her know that not only did my hips not move like that, (even with the assistance of alcohol) but I was tired, and uncoordinated. I figured as long as I was moving it was a step in the right direction. I kept moving and didn't have to worry about running into other people, but I did need to worry about being the only one who the instructor could watch, and the warped floor which tripped me several times. (yes, it really was warped - they placed it without preparing it correctly and it is so hot and humid there that the floor is buckling up. At first we thought it was for some new exercise because there was a hill in the middle of the room!) The only other thing was that the instructor was very expressive during her movements. I positioned myself so I could see her in the mirror, but not myself so I don't know how many times I was sporting a giggle as I watched her face contort. She winked, opened her mouth, hung out her tongue, and did all sorts of odd facial expressions. I began to think maybe I was supposed to be exercising my face in that way as well. Combine her facial expressions with her hip action and I almost thought I was in the presence of Miley Cyrus! I had a hard enough time following her lead, but when I watched her face too I just couldn't remember what I was doing! The third day I was able to gather a bunch of people and do water aerobics. That can be pretty tough - especially in hot humid weather in a pool that is not at all refreshing because it is so warm! The instructor took us through a good workout. She said she was really tired and worn out afterwards, but I think that may have been because she felt compelled to tell us a lot about her knees which lasted just about the entire hour. Our group doing water aerobics!! Can't beat that "workout" space!! The rest of my time spent on the business trip I didn't do an official workout, but I counted things like swimming, jumping off of boats, snorkeling, kayaking, and climbing steps. That counts right? Hi!Exercise is really important for fit health & body.If this is happen in vacation then it's really effective as well as interesting.In vacation Zumba class is really interesting at the same time effective for exercise.